"I could care less about rooming with a white man, I just wish it wasn't this white man." I have a friend that very rarely sheds a tear. I honestly believe that if one were to drop a piano on his foot he would simply keep talking and going about with life as if not missing a beat. There is, however, one thing that reduces him to tears: Brian's Song, a motion picture that, as any red blooded male will attest, gets us every time. Brian's Song tells the story of two football players, Brian Piccolo (Maher) and Gale Sayers (Phifer) who were rookies together on the Chicago Bears in 1965. At the start of the film the two aren't as much at odds as they are wholly different. Sayers is soft spoken and a bit shy while Piccolo is outgoing and jubilant about nearly everything. As the two compete for the same position on the team they also are selected to room together, making them the first interracial roommates in the history of the National Football League. As the two spend the season together it is apparent that a friendship may be a long way off, until Sayers is sidelined with an injury and Piccolo drives him to come back. As Sayers rebounds from the injury the two become friends, until Piccolo is diagnosed with a rare form of cancer. As nearly everyone knows, Brian's Song was originally a made-for-TV movie in 1971, a scant year after the closing events in the film. The original film is considered one of the finest television films ever made, and for good reason. So perhaps it is of the highest praise that the most recent version of the story is a worthy remake. Longtime television director John Gray (whose only film work was the Steven Seagal bomb The Glitter Man) brings a sense of style here that was not present in the original, though at times the flashiness is a bit off-putting. Scenes of Sayers and Piccolo bonding over the course of Sayers rehab sessions feel cheapened with the fast cut camera work and Odd Couple-like situations between the two. But that is not to say that Brian's Song is at all a wasted effort. I enjoyed the chemistry between Maher and Phifer perhaps more so than the relationship between Caan and Williams in the original. Maher (Party Of Five) is very good as the charismatic Piccolo and has a sort of jovial sensibility that makes him very likeable. Phifer (Clockers) is equally as good in his performance as Sayers from his first appearance to his heart wrenching closing monologue. There are small subtle distinctions between the new version of Brian's Song and its predecessor. In the most recent we are treated to several scenes chronicling Piccolo's battle with cancer as well as a stronger subplot involving each of the men's wives. These scenes help add to an already emotional screenplay about friendship. What makes Brian's Song special is the bonds of friendship that the film depicts. I challenge anyone to sit through Brian's Song and not be reduced to a puddle of tears as Sayers delivers a speech on courage in honor of his friend. This is an accomplished film, and a worthy remake of an already classic story. Image Transfer Review: Presented in a 1.78:1 anamorphic widescreen ratio, Brian's Song boasts an incredibly strong image transfer. The opening scene involving a ground level shot of a football field is amazingly well done in the level of detail present. Leaves of grass are crisp while the deep brown of the football has almost a three dimensional look against the backdrop. Colors are also well done with no bleeding and well-rendered fleshtones. There are a few moments where grain or print flaws are noticeable, but scarcely. A slightly cropped full-frame transfer is included on side two of the disc. Audio Transfer Review: A Dolby Surround track is offered for Brian's Song, and while not reference quality for the material it most certainly works. Dialogue is crisp and well recorded while the ambient sounds of a football stadium and the score are cleanly heard in the rear speakers. A nice sound mix. Extras Review: Theatrical trailers for the 1971 version of Brian's Song, as well as The Natural are presented in full-frame. Strangely absent are the extra features for this remake, as upon the television premiere advertisements and featurettes were all over ESPN and ABC. 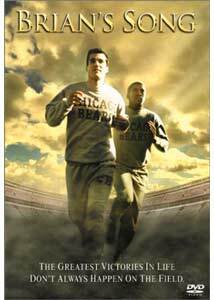 Though lacking in extra features Brian's Song is given a fine presentation on DVD, and the film itself belongs in any sports fans collection. I came into this remake unsure of just what a new version of a classic story might bring and came away with nothing but accolades for everyone involved. Recommended.